Lithography Stone for "The Four Humors". The Four Humors is an automaton that I have previously finished and shown at my gallery, but was never completely happy with the drawing of the paper dolls. After the show was over, I asked for the piece back and am currently remaking the central paper dolls in stone lithography and giving the dresses that represent the humors more visual interest. The four humors is an ancient medical theory in which all diseases, disabilities, emotions and behaviors are due to an excess or lack of bodily fluids: blood, phlegm, black bile, and yellow bile. The fluids also have organs that relate to the fluids: blood=liver, phlegm=brain and lungs, black bile=gallbladder, and yellow bile=spleen. I've redrawn the paper doll's dresses to reflect the corresponding organs. The girl herself is now drawn holding a fleam, or bloodletting knife. The mechanisms of the automaton will remain unchanged. 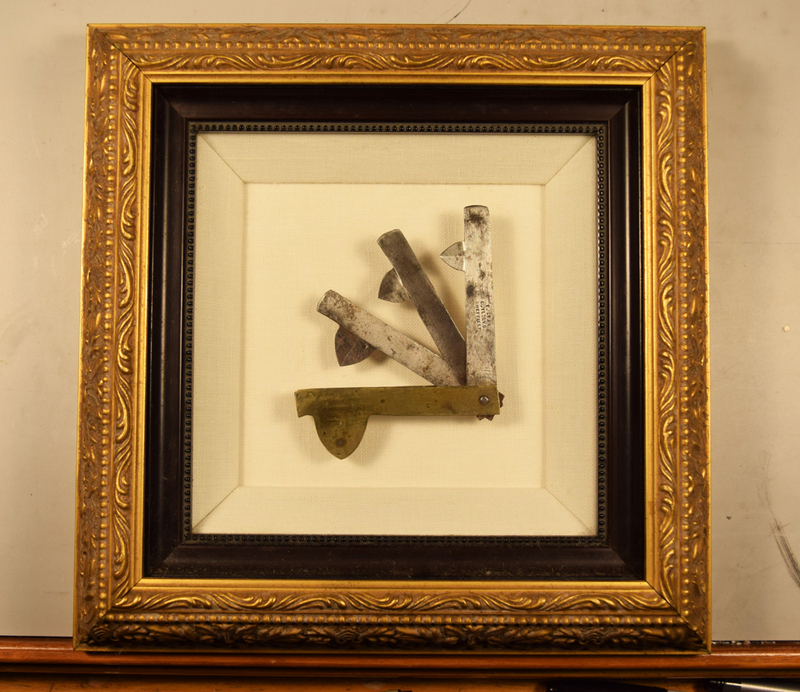 The changes of better design and drawing, the richness of lithography, and an addition of a new bronze title plate will make The Four Humors into a stronger piece. 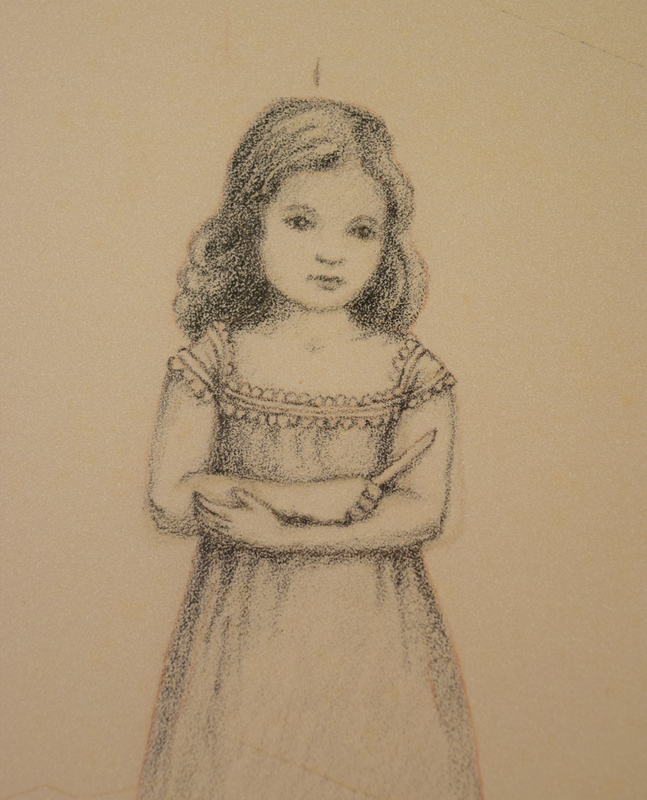 The central paper doll with her fleam, or bloodletting knife. Drawn on lithography stone. 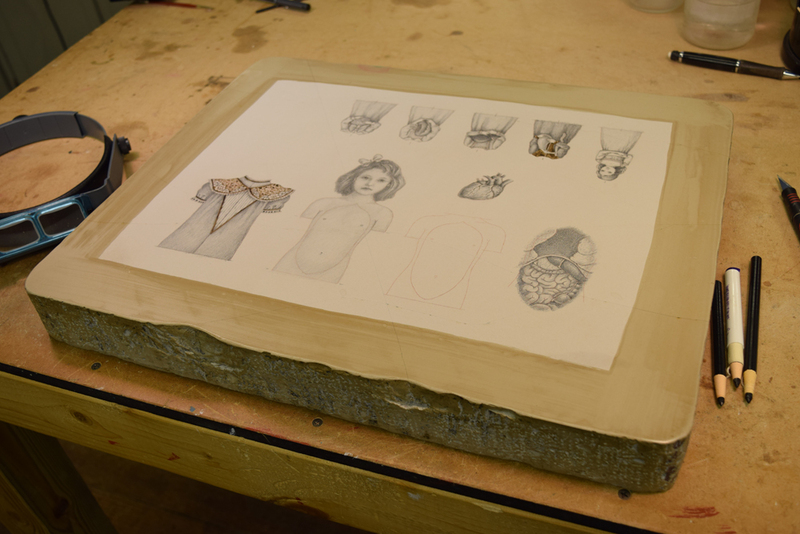 The lithography stone with finished drawings for two upcoming automata, The Four Humors and Cardiomegaly. The lithography stone with the drawings for the central paper doll and the dresses coorisponding to Black Bile (gallbladder) and Blood (liver). The lithography stone drawings for the dresses cooresponding to Yellow Bile (spleen) and Phlegm (brain and lungs). The bloodletting fleam from my collection.